Get cozy and listen to a story about the amazing woman who made Mercedes-Benz what it is today. The year was 1888. Queen Victoria still ruled in England, and the horse-drawn carriage was still the transportation of choice. A few people had invented “horseless carriages”, but they were mere curiosities, mainly to be shown off at fairs. Few were sold. None had found any practical purpose. That’s where Bertha Benz came in. Her husband, Karl Benz, was one such inventor, and had already received a patent on his “automobile fueled by gas.” She knew a bit about engineering, and she knew what her husband’s cars were capable of. All he needed was a push. 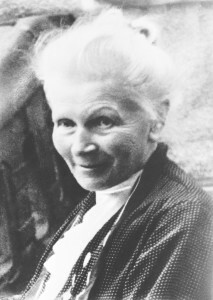 Sneaking out in the early morning with her two sons, Bertha Benz took her husband’s Patent-Motorwagen No.3 and set off for her mother’s house– 65 miles away. Imagine the perils of taking an untested new vehicle out into the open country, miles from your home. If the car broke down, she would have to fix it, or be stranded. And fix it she did, cleaning a clogged fuel line with her hairpin, and repairing and ignition wire with her garter. What she couldn’t repair herself, she stopped in towns for. After getting over the shock of seeing a woman come into town on a rumbling motorized contraption, the town cobbler lined the brakes with leather for her, and a blacksmith fixed a chain. Bertha got to her mother’s house a little after dark, and telegrammed her husband about her successful journey. She recorded everything that happened in careful detail, and her notes made it possible for Karl Benz to improve his automobile’s design, and make it road-worthy. Because no one had taken a car on the road before, no one had realized the need for gears. Bertha changed all that. At Mercedes-Benz of Beaumont, we’re proud to be part of this continuing history. Come in today inSouth Beaumont, TX. Take a test drive. If you ever find yourself in Germany, be sure to take the Bertha Benz Memorial Route to re-trace her historic journey. 0 comment(s) so far on Get cozy and listen to a story about the amazing woman who made Mercedes-Benz what it is today.